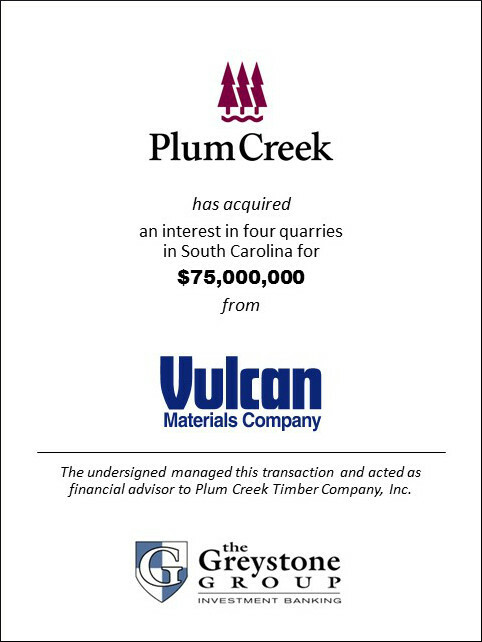 SAN DIEGO (January 17, 2013) – The Greystone Group announced today that it advised Plum Creek Timber Company, Inc. (NYSE: PCL) in its acquisition of its interest in approximately 144 million tons of aggregate reserves at four quarries from Vulcan Materials Company (NYSE: VMC) for $75 million. The quarries are located near the Greenville and Spartanburg, South Carolina markets and will continue to be operated by Vulcan. Beginning in January 2013, Plum Creek will receive royalty payments from the production and sale of the crushed stone from the quarries for approximately 25 years. “It is always nice to see the successful execution of an acquisition strategy that our firm helps develop” said Tim Oitzman, President of Greystone. Vulcan Materials Company is the nation’s largest producer of construction aggregates – primarily crushed stone, sand and gravel – and a major producer of aggregates-based construction materials, including asphalt and ready-mixed concrete. Vulcan’s coast-to-coast footprint and strategic distribution network align with and serve the nation’s growth centers.